When it comes to anti white racism, I admit I’ve been pretty tolerant of it. Mostly because anti white racism can be pretty funny so it’s hard to take seriously. As anyone who has perused Salon, the website for white people who hate white people; can tell you, it’s sometimes hard not to get a good laugh out of it. It’s hard to remember now, but at one time Salon used to be a legitimate and respectable magazine. But with stories like, White Men Must be Stopped, White Guys are Killing Us, America’s Angriest White Men, GOP base is still white and aging, and Time to Profile White Men; even the parody twitter account “Salon.com” has had difficulty topping the real articles and has often resorted to re-tweeting Salon’s real tweets. Yeah, we wouldn’t want too many rights gumming up the works. So I suppose I do fundamentally view a major difference between the comic anti white hatred of Salon, ranting Black Nationalists on Youtube, or various SJW’s on college campuses, and legitimate journalists positing their anti white racism in the public sphere without any backlash at all. That’s why I found myself someone shocked by the comments of New York Times columnist Anand Giridharadas on Morning Joe this week. Giridharadas is one of those semi regular guests to the set of the MSNBC show that doesn’t, to my view, seem to offer anything particularly compelling in the way of opinion other than the mouthing of whatever the latest conventional wisdom is. 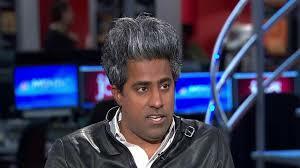 In the case of Giridharadas he also brings some sort of incomprehensible thing going on with his hair. It’s like he’s stacked a couple of bird’s nests up there. I guess that’s his gimmick. So check out the video at this link of Giridharadas. “I don’t want to wait for a leader to deal with this energy because I think how badly we went when we don’t deal with each other as human beings. I think every institution needs to do this. I would say to your point, this needs to be a two-way reconciliation, and here’s my suggestion for kind of each side. I think the elites we’re talking about who relate to understanding this pain, who didn’t see the roots of Trump, need to see it–need to re-engage with What American needs to understand what’s doing on. Putting aside the idea that if globalization is so hard on everyone, why are we doing it, I thought the real take away was, I realized that these guys, the establishment elite types like Milbank and Giridharadas were serious. They really do regard whites as some sort of problem, like an atavistic hold over that’s harshing everyone’s buzz. It’s pretty blatantly racist, but it’s not a racism that anyone particularly cares about. Although I think I’ll eventually find out. This entry was posted in Politica, Race and tagged Anand Giridharadas, Anti-White, Columnist, Dana, Demography, Identity Politics, Joe Scarborough, Milbank, Morning Joe, Politics, race, Salon, SJW, Social Justice Warrior, tribalism, Willie Geist. Bookmark the permalink. I too feel the target on my back, it’s ridiculous how they think hating White Males is morally righteous. These anti-White leftists have gotten too arrogant, they believe they’ve won and can’t stop from grandstanding. They think all of America is the dopey White Dad you see on TV commercials, and they’ll just take our country off our hands. If they win November 8th, they’ll grandstand some more, but it’ll be a Pyrrhic victory. A lot of middle aged White Men may be too scared they’ll lose their jobs if they speak out, but younger White Men have less and less to lose. More and more of them are realizing that society wants to denigrate them for alleged “sins of the father”. They have nothing to lose, and their legacy to reclaim. I just discovered your site while reading Lion’s blog, good stuff!